Unfortunately the record-breaking wet weather intervened and we had to cancel the full "Skills of the Hills" event in its usual form. 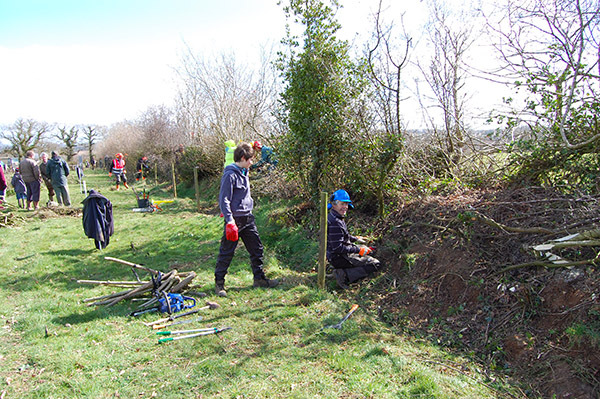 Very generously the land owner stepped in and allowed us to run smaller event a fortnight after the scheduled date and we held a straightforward hedgelaying competition then. The rescheduled 2014 event took place on Sunday 23rd March at Sheldon Equestrian Centre, Higher Northcott Farm by kind permission of Mr John Cunningham. Best regrowth of a length from the 2013 competition.